Imagine this on your wrist—one day that'll be cut in half. I had been wearing both bands for a bit more than two weeks. They'd been with me day and night, only leaving my wrists to briefly charge. They'd been with me as I prepared, and feasted, on an early Thanksgiving meal. They'd witnessed the birth of my second child. They'd reminded me, though I hardly needed reminding, that I should get more sleep while I rocked my son back to sleep. But it was at the end of a short run, the first since we'd come home from the hospital, that I was struck by how well matched these two were. The message read, "Basis: Good Job!" As exhausted as you likely are of seeing ads and hearing pablum about wearable computing, it is still a young and very fringe market. Strictly fitness-focused activity tracking devices have experienced the most success, while devices that aim to enhance our lives through new computing and interface paradigms have achieved modest results at best. If early CES hunches are any indication, next year will likely mark the flash point for the market—the promise of a competent wearable computer may well become a reality. But the wearable future partially depends on the wearable present. And as we end 2013, just how far along has the wearable computing market come? More importantly, how much further does it have to go? 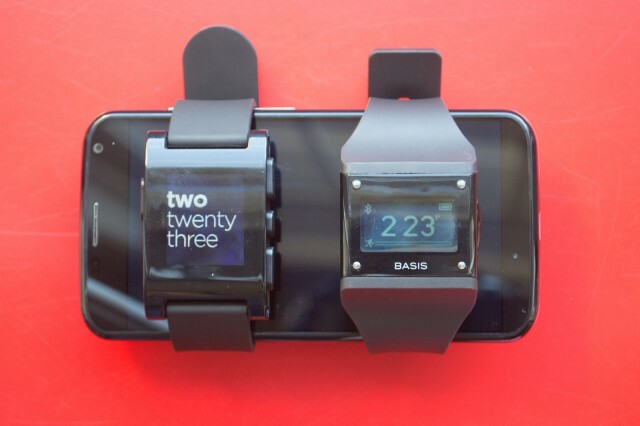 Exploring these answers starts by analyzing arguable the two best wearables available today: the Pebble Smartwatch and the Basis B1 fitness band. These two products highlight the current highs and lows of wearable computing, while serving as a great barometer for the future. One is firmly grounded here on earth (and on your wrist), while the other takes to the sky to enhance your life and well-being. And as you can see in the journal-like entry above, we've been tossing aside any concern for fashion to pair them up and evaluate the possibilities.